Okay y’all. I promise this is the last one. No more of Mark Forsyth‘s literary tricks, after today. But when I saw pleonasm used in one of the Psalms of Ascent, I just had to give it to you in the form of a Friday Prayer. Pleonasm, Forsyth explains, is “the use of unneeded words that are superfluous and unnecessary in a sentence that doesn’t require them.” Familiar phrases such as added bonus, personal friend, and safe haven are all examples of this belt-and-suspenders technique. They are linguistic time wasters. Why would anyone bother to fall down when a simple fall would have the same effect? I’ll give you the whence (and so will most modern Bible translators, who have swapped it for where), but I actually think we need the word up. Pleonasm is not always a bad thing and, when it serves to emphasize a point (“I saw it with my own two eyes!”), I think it works. 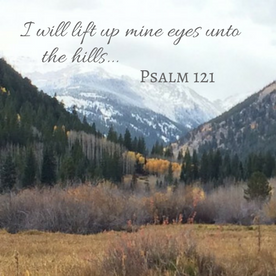 And in this case, I love the fact that the psalmist doesn’t just want to level our downcast gaze, he wants to make sure we look up. 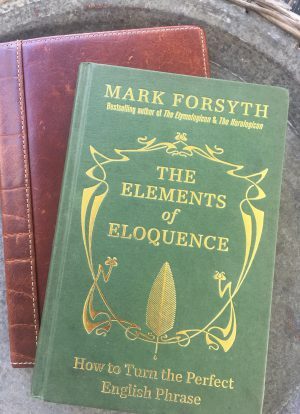 Last week, I told you about Mark Forsyth’s book, The Elements of Eloquence, in which he maintains that Shakespeare’s brilliance was rooted more in his ability to use literary tricks and techniques than in any sort of innate genius. One such technique is anadiplosis. Anadiplosis won’t pass your computer’s spell check (I tried), and I doubt it’s something you’ll want to break out at a cocktail party, but it’s a good trick to know, particularly if you want to sound logical, progressive, or just well-balanced. Anadiplosis happens when you take the last word of a sentence or phrase and then use it to begin the next one: A man takes a drink. The drink takes a drink. The drink takes the man. 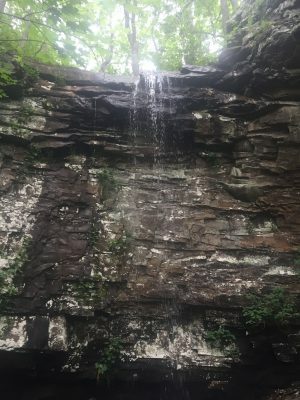 I wasn’t thinking about anadiplosis when I went hiking recently. I was, however, thinking about suffering. 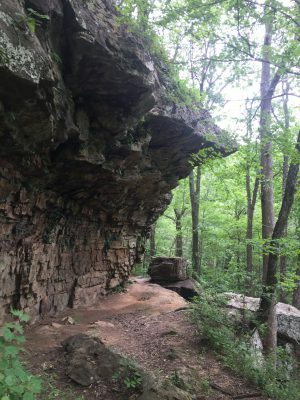 I’m not much of a woods-and-squirrels girl, and I hadn’t intended to hike Sewanee’s 20-mile Perimeter Trail (or any part of it) when I started. My plan was to walk to a nearby overlook and…look over. 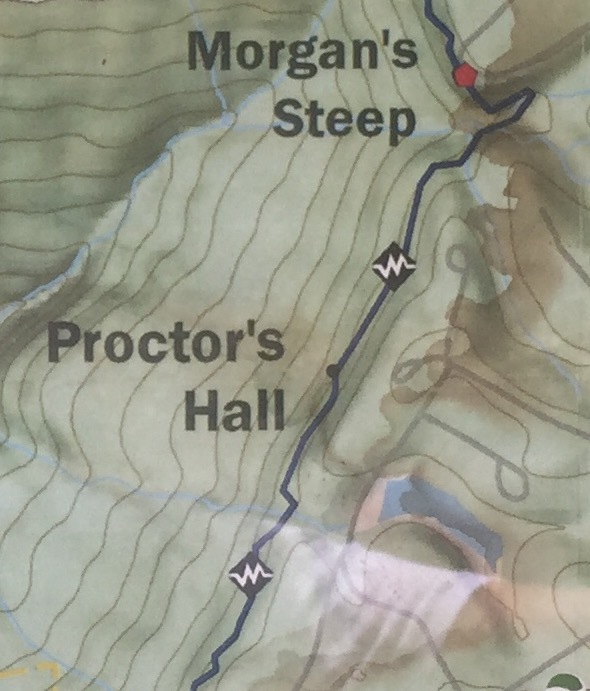 But then I noticed a trail map, conveniently posted next to the overlook. I had some time and I figured I could do a little bit of the trail. Like a mile, maybe. I could always come back later for the other 19. Not being an experienced hiker (not being any sort of hiker), I didn’t bother to read the fine print. I saw the jagged emblem that meant “Difficult”…but how difficult could “Difficult” be? It was only a mile, for crying out loud. I’d be in and out in 15 minutes. At first, I was captivated. To my left was a giant rock face. To my right was a 50-foot drop, just daunting enough to make you pay attention. Everything was quiet (unless you count the sound of scurrying, which I tried not to). Peaceful. I felt like I was alone in the world. Which, after about ten minutes, started to be less fun. A hole in the trail. Through a rock. Which was high. I tried going around, but there was no trail to the right. 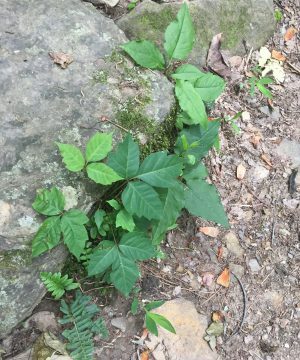 Just a sheer, poison-ivy-coated drop into nothing but treetops. And here’s the thing. I am not afraid of heights, but I am not big on falling. And I had no idea what was on the other side of the hole. Was it an even steeper drop? Seriously. Out of nowhere. I didn’t know about anadiplosis, but I did know that verse and where it went. I knew that if I started at suffering and got through the whole thing (not to mention the hole thing), I’d wind up at hope. I decided that since I had already experienced some pain (and on a happy note, the very real presence of snakes and mosquitoes took my mind off of the unseen lions and tigers), I could go ahead and move into the perseverance phase. Which felt good, since it meant that I had accomplished something. Or God had, in me. 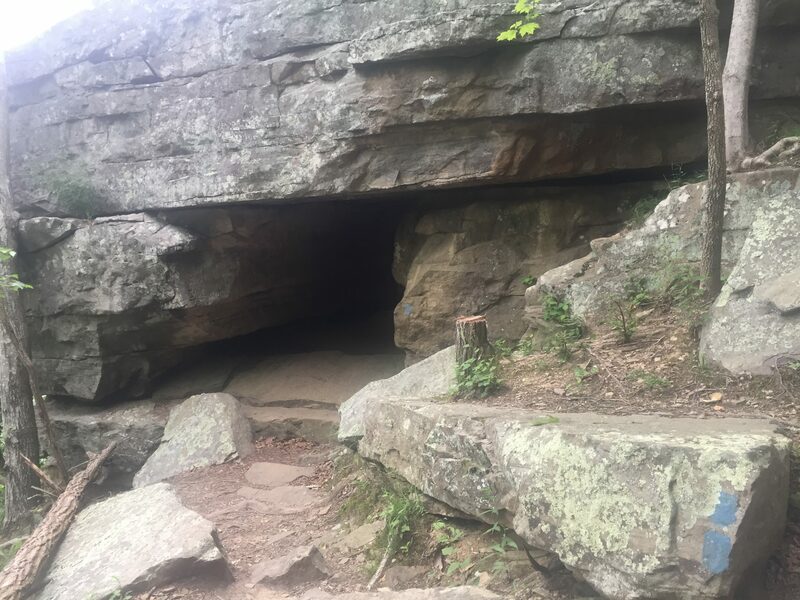 And if he would grant me the courage I needed to climb up to the hole, I was ready to count that as character. I sent a text to Robbie (which I didn’t think would go through) and a prayer to God (which I was pretty sure would), wanting them both to know where I was, in case things went bad. And then I started climbing. I made it. (Obviously.) 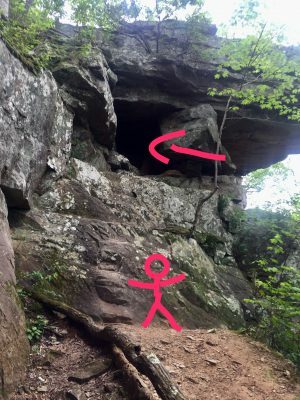 And when I crawled out of the hole on the other side of the rock, I had three rewards. I can’t remember when my heart felt so full, or so grateful. 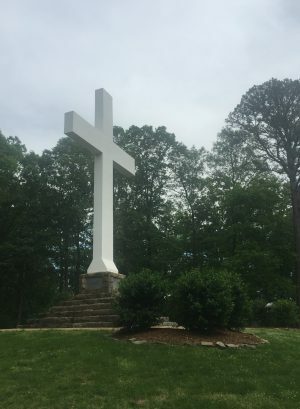 And, I realized, I would not have appreciated the cross (or the hope it delivered) had I not spent that time on the trail. 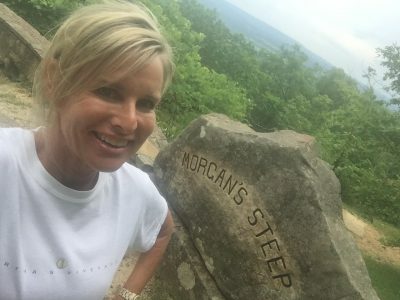 Walking through fear – and coming to the place where my own strength wasn’t enough, where my only two options were to turn back or go forward with a God I couldn’t see instead of a rope that I could – is what brought me to hope. And remember, you’re not alone. Count on God to strengthen your character. He gave me courage; he will supply what you lack. He will lead you to hope. I wish I had a clever way to use anadiplosis to wrap up this post, but I don’t. All I can do is repeat what Paul said – that suffering produces perseverance; perseverance, character; and character, hope – and then point to the conclusion Paul draws: And hope does not disappoint us, because God has poured out his love into our hearts by the Holy Spirit, whom he has given us. My friend Nigel (a former Royal Marine Commando who now heads up By His Wounds, a ministry dedicated to helping veterans and others who need physical and emotional healing) says that he wakes up every morning and smiles. Even if he doesn’t feel all that cheerful or happy, he wills his face into a grin – even before he gets out of bed. Some Bible brainiacs will tell you that “the day” this verse talks about is the day that Jesus entered Jerusalem, riding on a donkey. Others say it is about the Sabbath. And still others (including those in the first two camps) maintain that, in the big picture, this verse calls us to rejoice because – thanks to God’s work at the resurrection – we have a Redeemer and a forever King who has beaten death and forgiven us, once and for all. I agree with all of these people. And, at the risk of sounding theologically shallow, I also agree with Buddy the Elf. In a world where there are plenty of things not to smile about, I want to start my days the way Nigel does. I want to choose joy, knowing that today’s difficult circumstances and challenging relationships are not the big-picture story. The big-picture story is that we have a good King who has saved us, who loves us, and who is still active and at work in our lives. My bedside table always has a stack of books by a fairly diverse collection of authors. P.G. Wodehouse (think Downton Abbey, only funnier and more redemptive), C.S. Lewis (just finished Prince Caspian, again), and John Grisham (always a fun beach read, plus he’s a U.Va. fan) have all been in the mix this summer. “Shakespeare,” author Mark Forsyth begins, “was not a genius.” He was a great writer who “started out badly” and only got better because he “learnt techniques and tricks.” The Elements of Eloquence is full of such tricks, all artfully articulated (which would be an example, of course, of alliteration). Whether you’re looking to snag a Pulitzer or just step up your thank you note game, this book is a winner. And finally, I am finding myself longing for more of the Holy Spirit. 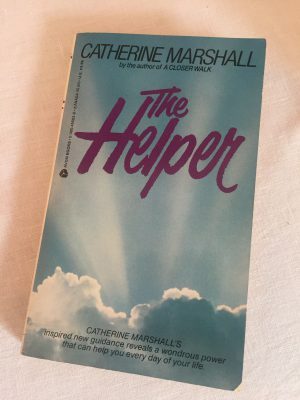 Happily for me, the gals in our church are doing a summer study on Catherine Marshall’s The Helper, an oldie-and-goodie that covers who the Holy Spirit is, what he does, and a whole lot more in 40 bite-sized readings. 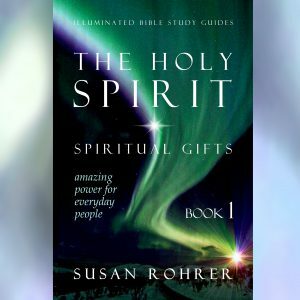 Not only that, but I’ve recently discovered a two-book series about the Holy Spirit by Susan Rohrer. Voted “Most Sensible” in high school (a designation she considered an indictment, rather than a compliment), Susan hardly seems the type to delve into things like supernatural gifts. But she does so – with exquisite grace and with a relentless attachment to Scripture, whether she’s talking about “out there” stuff like gifts of healing and prophecy, or the more socially acceptable graces (things like teaching, encouragement, hospitality, and even exceptional creative or technical abilities). If you do, too, check out The Helper or Susan’s books. And if that’s not where you are (or where you want to go), then just stick with Mark Forsyth. Because, as far as I know, literary tricks like anadiplosis (which I may blog about next week, so start getting excited!!) have never sparked any controversies. 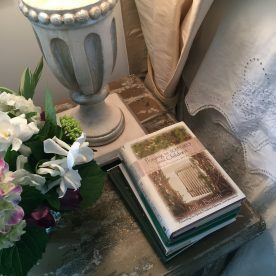 A sweet friend lost her father last week. He was 94 and had lived a great life, but that didn’t diminish the ache she felt at his passing. I told her I get it. It’s been 16 years and, as we prepare to celebrate Father’s Day, I miss my dad as much now as ever. I’m grateful for my father – and, in fact, for every dad out there who is doing Dad Stuff. It can’t be easy to always have to carry the heaviest suitcases, get the wasps out of the attic, and keep it together when your wife makes you late. Again. 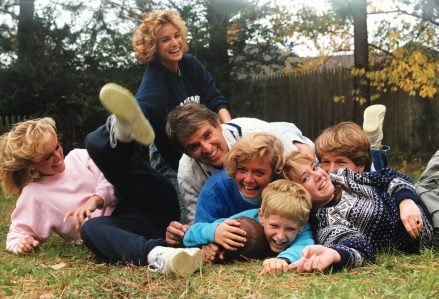 Note on the family pic, circa 1985: My family of origin was never known for its athleticism. This pic was snapped shortly after Robbie (my brand new husband, who is hiding his face for good reason) tackled my dad. He still says he “didn’t mean to hit him that hard” but hey. He prevented a touchdown. That’s not in the Bible; it’s from Robbie’s all-time favorite movie, The Sound of Music. But it’s a good line, particularly when you consider that God’s windows are not consolation prizes. They are never his “Plan B” for when you don’t get to walk through the door (to the house, the job, the relationship, the whatever) you want. Instead, when God shuts a door and leads us out through a window, it’s because he has a much better destination in mind. 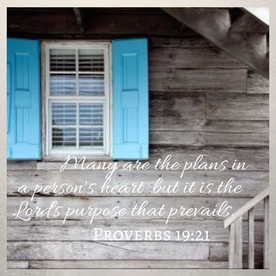 Proverbs 19:21 says, “Many are the plans in a person’s heart, but it is the Lord’s purpose that prevails.” You might be struggling with disappointment or sense of defeat today, but know this: Whatever it is that has happened (or hasn’t happened) has not taken God by surprise. He is in control and he loves you. The door might be shut (and you might not yet see any window), but God’s purposes will be accomplished. News Flash: Friendship is good for you. Researchers at U.Va. recently revealed evidence that backs up the idea that the stronger your relationships are, the better your health will be. I won’t go into all the details (they use words like “hypothalamus” and “epinephrine”), but the gist of the report is that if you are under “the threat of electrical shock,” your brain will be a whole lot happier if “a trusted loved one” is near. And, if you are holding that person’s hand, all the better. I love it when science catches up with what Christians have known all along: We are created for connection. We thrive in community. When Jesus told us to “Love one another,” he obviously knew that we’d need an uninhibited hypothalamus in order to effectively respond to stress and other unfortunate circumstances. 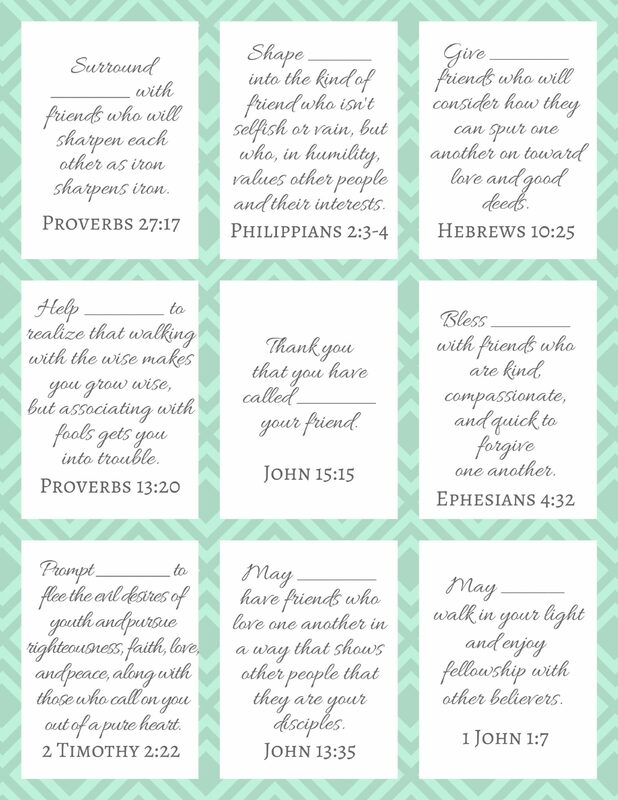 To download these prayer cards as a letter-sized PDF (you’ll have to cut them up by yourself), click here. Pray the verses for yourself, for your kids, or for anyone who might feel a little James Taylor coming on (like maybe they are down and troubled, or they need a helping hand). And remember, next time you get caught in a lightning storm (or if you find yourself in one of U.Va.’s brain imaging scanners while a red indicator “X” hints that you are about to be shocked), God has you. He is with you, wherever you go. One of my favorite things about writing books is getting to interview people. Praying the Scriptures for Your Adult Children comes out later this year (I’ll keep you posted! 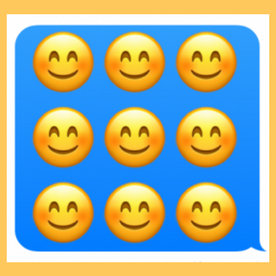 ), and as I was working on a chapter about the different ways our kids come to faith, I talked to one mom who is convinced that God sometimes takes them down paths we would not have chosen to keep us from patting ourselves on the back. What a wise mama! 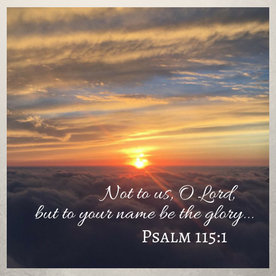 And I couldn’t help but think about her counsel when I read Psalm 115:1 this week: Not to us, O Lord, not to us but to your name be the glory, because of your love and faithfulness. Everything comes from you, Lord.